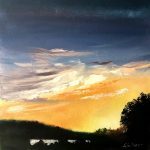 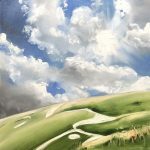 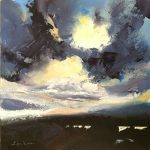 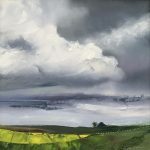 Lin is currently exploring mood and atmosphere through cloudscapes in oil painting, often in a square format, with paintmarks made using brushes, her fingers or a palette knife. 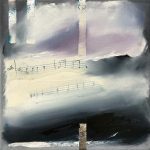 In her contemporary landscapes, she works from observation, sketches and photographs. 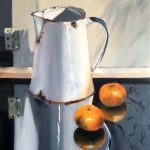 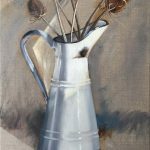 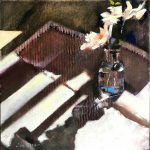 Sometimes she goes back to her old favourite still life themes of vase and jug paintings in oils, exploring the object in a quiet, shallow space, giving the object a museum-like sense of presence. 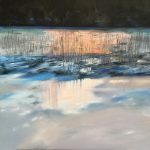 Originally from South Africa, Lin’s background is deeply rooted in fine arts, and after many years in calligraphy and graphic design, she returned to her first love of oil painting in 2016. 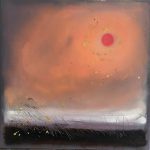 She taught graphic design and calligraphy internationally and is one of the better known British Lettering Artists. 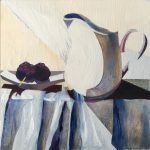 Lin Teaches oil painting at Oxford Summer School and Ardington School of Craft with occasional workshops in her studio. 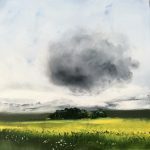 There is more information on her website about her teaching.